Most of us have heard stories of divers succumbing to Shallow Water Blackout (SWB). However, it is when one loses a close friend or experiences a SWB that the reality really hits home. Firstly, the term Shallow Water Blackout or SWB is a misnomer. A true SWB is due to staying underwater in a shallow pool (shallower than 5m) for longer than what the body has suffi cient Oxygen reserves for as would be the case in static apnoea. The blackout divers experience after coming up from depths >10m is technically a Deep Water Blackout. However, for ease of explanation the term SWB will be used. Freediver Blackout is perhaps the more encompassing term as it would cover the 3 major blackout types: namely, 1) classic SWB, 2) Surface Blackout and 3) Static Apnoea Blackout (which occurs most commonly in a swimming pool). Sadly, about half of diver deaths occur after a diver reaches the surface and attempts a breath then blacks out and sinks. This is called a surface blackout. This is due to the rapid decease of pressure in the lungs when blowing out air to take in a deep breath. It is almost a guarantee that most of the more advanced or profi cient divers have had a close SWB episode. Whether it was from pushing new depths or seeing that elusive species or trophy fi sh the end result was the same, a little wobble on the surface of uncontrolled muscle spasms either encompassing the arms and legs or just the muscles used for breathing. In the Freediving fraternity this episode of spasms is called a “Samba” and the only signifi cant meaning it carries is that a SWB was imminent. The diver was literally seconds away from being there one moment and then not the next. mostly due to the regular experience of them. The reason for having a blackout is related to the physiological and physical changes occurring rapidly in the last 8–3m from the surface when ascending from a dive. Without going into too much detail when diving we put into play a variety of physical “laws” devised by eminent Physicists with the names of Dalton, Newton, Boyle, Charles and many more. 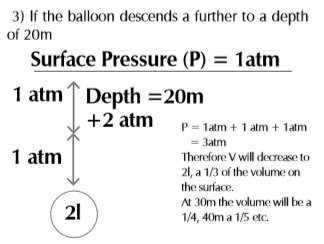 When diving, for every 10m of depth, pressure increases roughly by one atmosphere (atm). That is to say, the “weight” of the air experienced at sea level. 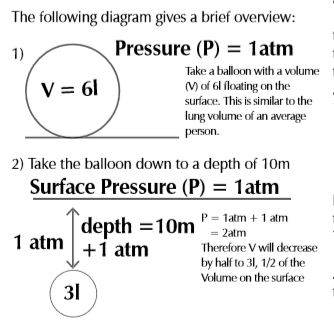 A balloon at sea level with 6l will have only 3l of air at 10m due to the additional pressure. This is why the deeper we dive the more we have to equalise to stop the pain in our ears and sinuses. How then does a SWB occur? Although pressures increase the deeper one descends, the greatest percentage change occurs in the ﬁ rst 10m where the pressure is doubled. From there on the change is indirectly proportional to the depth. This may sound confusing but the following will explain. It can be seen that at 10m pressure is a half (1/2) and at 20m a third (1/3). This principle explains why the greatest rate of change of volume is biggest the last few metres and thus why the danger zone for SWB is between 8m and 3m from the surface. Another factor, and perhaps more importantly that is often overlooked with possible disastrous consequences is Dalton’s Law, or more simply, the effect of pressure on the solubility of the gasses, notably Oxygen (O2), in our blood. We have all heard of the “bends” or Nitrogen narcosis, where the effects of Nitrogen on SCUBA divers at depth have been studied ad nauseum. While Nitrogen isn’t a problem for breath hold diving, the effect of pressure on Oxygen solubility is. Simply put, the deeper you dive, the more Oxygen dissolves in your blood. Now to digress, we look at how the body regulates breathing. This is done via the “breathing centre” in the brain and is the one action the body does automatically that we can also control. But only to a point, whereupon the brain will override conscious control, take over and breathe automatically. Some parents will tell of stories where their children throw tantrums and threaten to “hold their breath” until they hurt themselves. Parents panic and acquiesce to the child’s desire. It is impossible for a person to hold their breath to the point of damaging the body due to oxygen starvation. It would be almost impossible for even the most disciplined individual to hold their breath on land until they pass out. Breathing is largely (80-90%) controlled by the level of Carbon Dioxide (CO2) dissolved in our blood. When CO2 levels reach a certain level, the brain sends out signals that you must breathe. These signals start out as slight discomfort and progresses in severity as the CO2 levels rise. As Spearos and Freedivers we have learnt and taught our bodies to ignore and suppress these initial urges to breathe. Most people cannot hold their breath for 30 seconds yet most spearos should be able to do a minute comfortably. The more elite guys can do this for up to 5 minutes hence their awesome bottom times. As said, the body’s urge to breathe is mostly controlled CO2 levels. O2 exertsd very little control over breathing in the healthy individual. Atmospheric gas is comprised mostly of Nitrogen (78%) and Oxygen (21%) that means that all the other gasses make up the remaining 1%. CO2 levels are somewhere around 0.038%. It is plain to see that CO2 levels are very low, in fact 552 times lower than Oxygen. A similar ratio is also encountered in the body. Some divers erroneously think they can increase their bottom time by hyperventilating which is simply purging the CO2 without actually increasing the O2 any signiﬁ cant amount. Looking at the composition, if you manage to purge all the CO2 and replace with O2 you have not really achieved anything yet divers still persist with this very, very dangerous practice. All that has really been achieved is to fool the breathing centre into thinking that the body does not really need to breathe, hence the longer “apparent” bottom time. This coupled with the extra dissolved O2 is what gives that comfortable feeling at depth. When a diver surfaces and enters the critical zone of between 8m and 3m where the pressure changes is most rapid the extra Oxygen dissolved in their blood due to the pressure at depths literally passes out of the blood back into the lungs as it is no longer as soluble in the blood as at depth. This sudden drop in O2 coupled with the diver overstaying their time on the bottom is what results in a SWB. This may seem complicated yet it is so simple. There are also a whole host of other factors that may come into play. Even getting a full breath of air mixed with Outboard engine fumes containing Carbon Monoxide can be dangerous as the amount of Oxygen available can be lessened. Now that the physics and physiology has been covered what exactly happens and how can a SWB be prevented. Also, why do new divers hardly, if ever get SWB’s? Normally in extreme sports lack of experience is a killer. In spearﬁ shing however, SWB’s have one thing in common; namely – experienced spearos. Beginner divers are normally in trouble through various factors like not knowing how to negotiate rough surf or currents, but hardly ever SWB’s. This will apply mainly to deep dives of 15m and deeper. Very few divers have the ability to dive 20m consistently and the number in SA who can dive deeper than the “magical” 30m (100 feet) mark number less than 20. Apparently experiencing a SWB is a “pleasant” feeling. Seeing it is one of the most terrifying things to behold. This is a recollection from a friend who saw a fellow diver experiencing a SWB. Firstly, new or inexperienced divers are unlikely to have SWB’s for the simple reason in that they cannot suppress the urge to breathe as more experienced divers can and are able to. They also do not tend to dive too deep as the pressure freaks them out and they turn and scream for the surface. However, when experienced divers take out beginners to areas way beyond their means and abilities, they may either scare or intimidate the poor bloke into giving up spearﬁ shing or if the person is very competitive, by trying to impress the others, they may then get themselves into trouble. Thus, never take inexperienced divers to areas that are beyond their capabilities. It isn’t fair to that person or to their families if something goes wrong. The whole world is now getting as litigious as the USA and a person may well ﬁ nd themselves in a lawsuit that could have dire ﬁ nancial consequences apart from having the death of a friend on their conscience. 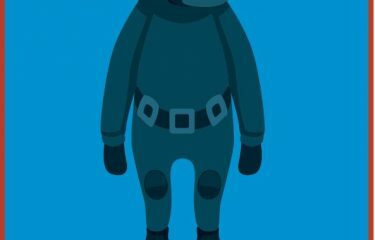 The following will cover the most critical aspects and techniques to increase safety of the diver. Most divers spend months and even years before getting an opportunity to learn and dive with the top dogs. Some of us are fortunate to get with the big dogs straight away, whether this mentoring is through a friendship, learning from a father or a through one of the many courses that are now available. The fast tracking of learning is beneﬁ cial, but one fraught with many dangers. A beginner will not learn their own limits and the initial fears, which will normally keep them safe, will be falsely expunged as the experienced divers around will give a perception of extra safety and conﬁdence. 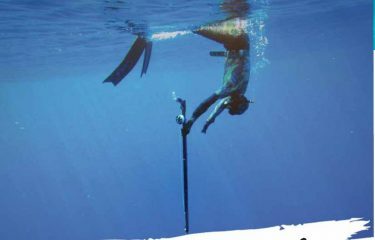 Similarly, the current fad of using courses provided by proﬁcient freedivers to increase depth and bottom time can be very dangerous if not correctly applied. Stories of divers doubling their personal bests over a weekend can give false conﬁdence and lead to tragedy if those divers carry on unmonitored. Inherently spearﬁ shing and freediving being breath hold diving are the same, but the applications are very different and divers must be careful from whom instruction is obtained. Credentials and references of coaches must be obtained. Currently the providers of these courses are the real deal. But inevitably, sensing a gap in the market, some will use this to try and make a quick buck despite their actual lack of knowledge but with glibness of tongue, will convince all and sundry of their abilities. Generally, those new to the sport, may also be ignorant of the pitfalls. Beginner divers especially, use far too many weights to help them get down. Insofar as records show, no one has ever had a SWB while swimming down, only swimming back up to the surface; yet divers do things which make it more difﬁ cult to get to the surface. Unfortunately this tends to remain as their experience increases and inherent bad techniques are entrenched. Apart from doing themselves a great disservice as it takes more energy the dangers are increased tenfold as a diver has to use more energy getting to the surface. This also stems from their beginnings in shallow water where lots of weight is a prerequisite and when progressing to deeper water, ignorance and bad teaching causes them to keep all the weights instead of taking off a few or not enough to allow for depth. It is not uncommon for more experienced divers to have several weight belts to cater for different conditions. With some training bad habits can be broken and divers can be taught to dive light. Most divers believe that being buoyant from 5m is enough, but if a blackout occurs at 8m the person will sink. Also if SWB occurs the muscles sometimes relax and most of the air in the lungs can be “blown” out which then also cancels buoyancy. Other times, the throat muscles tighten in laryngospasm where no air can go in or out. This is very important to remember in case CPR is required. Thus, if dives of deeper than 15m are to be undertaken a good rule of safety is that you should be buoyant from 10m-12m and that is with no air in the lungs. Initially it is more difﬁ cult to get down but proper instruction on swimming will help. Factors like correct ﬁ ns, body posture, kicking style etc are all facets that could hinder descent and if possible, getting a friend to ﬁ lm you with an underwater camera will help greatly as you can see for yourself how ﬂ awed your technique may be. Lastly, when in any sort of trouble, drop your weight belt immediately. Make it a habit of loosening the clip when coming up from a deep dive. If you blackout, the belt will fall off and your increased buoyancy may save your life. Today the buckles in use have been designed that once loosened they will not engage again. Back 2 Basics Weightbelt The problem comes in when trying to balance out the buoyancy of the wetsuit with the weight belt.